A few days ago I needed a do-ahead fancyish first course for a birthday dinner party, and this chilled beet soup filled the bill. It’s colorful, delicate, and light. 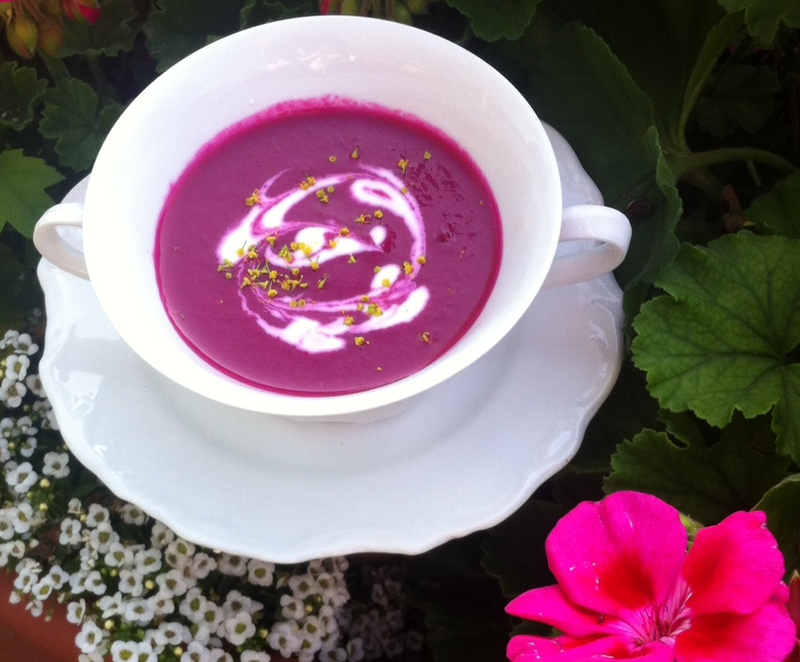 Even the reluctant anti-beet eater will be tempted to taste it in this guise, cousin to the classic Russian borscht. The immediate feature of this soup is its brilliant color. To hold this bright tint, tender, cooked, diced beets simmer in the stock base for only a minute before meeting their pureed state in the blender jar. Beets left to rest in the hot stock will fade, and the resulting soup will pale. (Thank you Ballymaloe for this essential tip.) Plan to have the beets cooked, diced and ready while the buttered onion simmers in its broth, and remove the beet mixture from the saucepan quickly after just heating through. Pureed and packed in a glass jar, the soup can easily wait in the fridge for a couple of days before finding places in simple small bowls. A swirl of cream-thinned yogurt and a snip of dill will bring the passion of deep purple and sweet summer to your table. chopped dill, dill flowers, shredded basil, etc. *Cover scrubbed beets with water in snug saucepan. Add salt and little sugar. Simmer covered about an hour or until tender (press with finger and test with toothpick). (Alternatively, beets could be wrapped in foil and baked.) Cool, peel, dice. Sweat the onion in butter under butter wrappers until soft but not colored. Add garlic, chili, cloves, sauté few minutes longer. Add stock and simmer 5 minutes. Add cooked diced beets, simmer for 1 minute. Pour contents of saucepan into a bowl to stop the cooking (any longer cooking will cause beets to lose color). Puree in blender as soon as possible. Season with salt, white pepper and a pinch of sugar if needed. Chill. Before serving, thin the yogurt with light cream and season with salt. Ladle soup into bowls and spoon yogurt cream on top of soup. Swirl with toothpick and garnish with dill. Serves 8. You are currently browsing the Mary Jo's Kitchen blog archives for July, 2015.